Photo by Nevit Dilmen. Creative Commons license. Remember that post I made a few weeks ago about Creativity in the Workplace? Authors Rainey Tisdale and Linda Norris ran a related networking and creativity event at the USS Constitution Museum last week in cooperation with the NEMA-YEP group. With the blood-and-attitude-shifting assistance of music and a dance circle, Tisdale and Norris led participants in a speed-networking creativity discussion, challenging each of us to consider and then share what we were passionate about, what we wanted more of from our jobs/careers, what we were good at, and how we could implement and incorporate into our daily routines elements of their steps to creative thought processes. Have a Tumblr? Freshen up your Dashboard! A lot of museums and libraries have gotten into publishing fun stuff from their archives and collections, visitor images and videos, and even staff-created music videos on tumblr. I recommend just poking around the museum tags until you find some that appeal. Who doesn’t want neat and beautiful art and animals and whatever on their screen every day? NPR has thoughtfully collected a list of their own and other public media tumblr blogs, featuring news, science, arts, politics, history, food, all of the above, and more. The fun and passionate folks over at We Need Diverse Books are doing a summer reading series, where they recommend books by diverse authors and/or with diverse characters that share elements with better known works, ie ‘readers of Harry Potter will probably like Nnedi Okarafor’s Akata Witch.’ They’ve just started, so you have a whole summer of fun kids’ and YA lit recommendations ahead of you. I have such a love/hate relationship with Twitter. People post all these cool links and then I end up with roughly a bajillion tabs waiting to be read. American Museum of Natural History – fun science facts, all the time! There are, of course, many more, and if you have suggestions for me, feel free to add them in the comments! Meanwhile, don’t let yourself get overwhelmed by information overload, either, and remember to give yourself time to reflect and ponder and daydream and make those brain-popcorn connections between information and ideas…or in Norris and Tisdale’s term: Incubate. 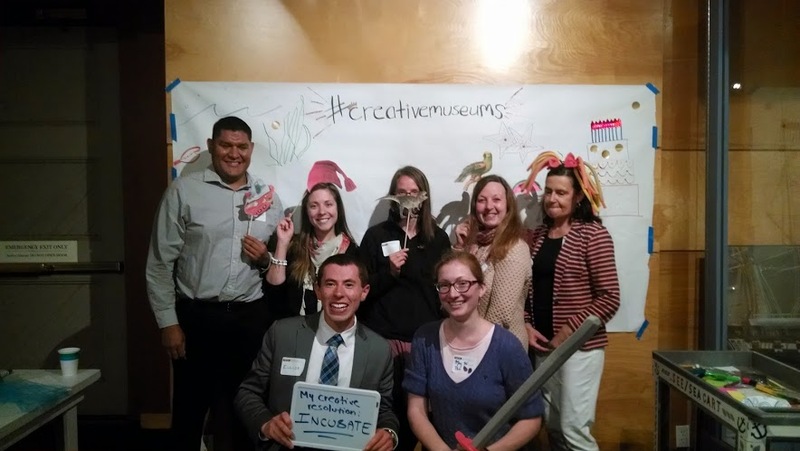 The PEM contingent at the #creativemuseums DIY photobooth. Yes, I’m the one with the sword. Naturally. Don’t you think better with a lightsaber in hand? However, it now turns out that future generations will be able to find out what was on the mind of folks around the world and up and down the spectrum of celebrity — from the online and backstage shenanigans of rock stars and actors to the mundane details of what you and I thought about the recent spate of natural and manmade disasters. Late last week, The Washington Post reported that the Library of Congress is going to be archiving all of Twitter’s public tweets, on a six-month lag (to separate ‘history’ from ‘current events.’) Though some people are naturally skeptical (and uninterested in what Al from Boise had for lunch when he visited San Francisco on a business trip), others point out that hearing people’s off-the-cuff responses, finding out what interests them at a particular time, or evidence of casual correspondence between public figures is a historical goldmine. Also mentioned in the article is also the benefit to populist history: taking the archives and sifting through the hashtags, etc, future historians could in fact get a real picture* of societal values and interests in an increasingly fractured “information age.” I once heard historian and author David McCullough speak, and was incredibly struck by his statement that though we live in an age which is ‘information rich,’ future historians could easily find it ‘information poor,’ especially if and when digital records are lost. Who writes letters by hand? Who keeps a steady handwritten journal? he asked. What possible tools will the future students of the past have to understand an age where newspapers begin to disappear and half our life is lived by email? 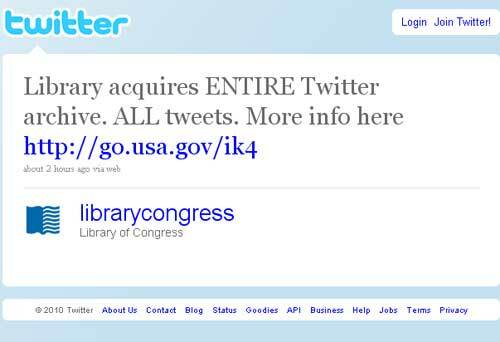 Though it does not solve the digital-record-dilemma, perhaps the Library of Congress Twitter archive is one way to answer his–and history’s–concerns. *And by “real,” the article and I would both like to point out, we mean “the sections of society which are aware of and interested in a communication medium like Twitter.” All historical sources have their context and limitations, after all! Putting Twitter in a Historical Context? Wait…really? Twitter, the ‘so new you have to be part of it to look cool’ mini-status-update gadget that half the world loves to hate already? Twitter plus history equals something interesting? While I admit to being slightly biased about just how cool this organization is, (I worked on the interactive timeline on The Coming of the American Revolution) the Massachusetts Historical Society has gone and done something kind of fun. This summer marks the 200th anniversary of John Quincy Adams’ voyage to Russia, to the diplomatic post appointed to him by then President Madison. Though JQA wrote long diary entries as well, he also kept a line-a-day journal with navigational coordinates of their journey and a summary of the day’s highlights–much like today’s Facebook status updates or Twitter posts. The MHS is doing a daily re-post of those summary entries on Twitter, and also has an overview page about the project available at their main site. My favorite techno-gadget they’ve included is a progressive Google map tracking JQA’s progress across the Atlantic, linked from the end of most posts. – What other historical figures would you love to see as a Twitterer or in some other modern guise?